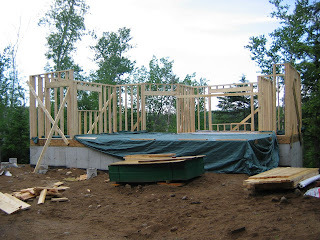 As of Sunday, June 22 at about 5 pm we have been able to complete the framing on three sides of the cottage. We had been hoping for more but it rained until about 7:30 am and then we spent - as revealed in a previous post an hour draining the basement of water from the massive rain storm the previous evening. So we started late. On top of that we ended early - about 5 pm. And lucky we did as about 5:20 pm the skies opened up with rain once again. We we just able to get the tools away and the tarp back on the floor. Next weekend the target is to finish the framing on the remaining walls put the sheathing up on all the exterior walls. We are hoping to get the framing of the superstructure for the deck as well as it contains some key posts which support portions of the roofing trusses.